Find copies of the Neo Lao Hak Sat (or, Xat) weekly bulletin with photographs and biographic information of U.S. Prisoners of War captured by the Pathet Lao. ຄົ້ນຫາສຳເນົາແນວລາວຮັກຊາດ ( Neo Lao Hak Sat) ແຈ້ງການຂ່າວລາຍສັບດາ ພ້ອມຮູປພາບ ແລະ ຂໍ້ມູນປະວັດຂອງນັກໂທດສົງຄາມຊາວອາເມລິກັນ ທີ່ຖືກຈັບໃນປະເທດລາວ. ໃບແຈ້ງການຂ່າວແນວລາວຮັກຊາດລາຍສັບດາຂອງແທ້ ພ້ອມຮູບພາບ ແລະ ຂໍ້ມູນຊີວະປະວັດຂອງນັກໂທດສົງຄາມ ທີ່ຖືກຈັບໃນປະເທດລາວ. 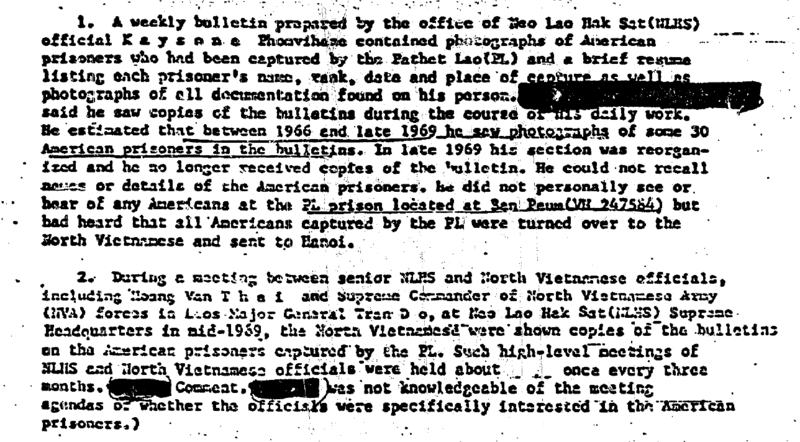 According to a U.S. government report, the Neo Lao Hak Sat (or, Xat; NLHS) published a weekly bullet from 1966 to 1969 that contained the pictures and biographic resume of up to 30 Americans captured by the communist Pathet Lao ປະເທດລາວ. The bulletin was issued by the office of NLHS official Kaysone Phomvihane ໄກສອນ ພົມວິຫານ. 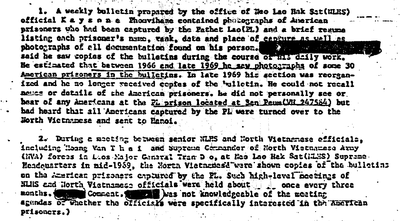 These documents are important because only nine POWs were returned from Laos and U.S. officials believe more had been captured. If these documents exist, they would provide evidence on U.S. POWs captured but never returned. Please contact us if you have the Neo Lao Hak Sat Bulletin or other information on American prisoners not returned from the Vietnam War or other conflicts. ຕາມລາຍງານຂອງລັດຖະບານສະຫະລັດອາເມລິກາ, ແນວລາວຮັກຊາດ ( Neo Lao Hak Sat: NLHS) ທີ່ຕີພິມໃນແຈ້ງການຂ່າວລາຍສັບດາ ຕັ້ງແຕ່ປີ 1966 ເຖິງປີ 1969 ມີຮູບພາບ ແລະ ຂໍ້ມູນປະວັດຂອງຊາວອາເມລິກັນ 30 ຄົນ ທີ່ຖືກຈັບໂດຍກົມມຸນິດປະເທດລາວ. ໂດຍຫ້ອງການ NLHS ຂອງທ່ານ ໄກສອນ ພົມວິຫານ ເປັນຜູ້ອອກໃບແຈ້ງການຂ່າວນີ້. ເອກກະສານເຫຼົ່ານີ້ມີຄວາມສຳຄັນ ເພາະວ່າມີພຽງນັກໂທດຊາວອາເມລິກັນ 9 ຄົນທີ່ຖືກສົ່ງກັບຄືນຈາກປະເທດລາວ ແລະ ທາງການສະຫະລັດອະເມລິກາ ເຊື່ອວ່າຍັງມີຍັງມີອີກຫຼາຍຄົນທີ່ຖືກຈັບກຸມ. ກະລຸນາຕິດຕໍ່ພວກເຮົາ ຖ້າທ່ານມີແຈ້ງການຂ່າວ ແນວລາວຮັກຊາດ, ຫຼື ຂໍ້ມູນອື່ນໆກ່ຽວກັບນັກໂທດຊາວອາເມລິກັນ ທີ່ບໍ່ໄດ້ຖືກສົ່ງກັບຄືນ ຈາກສົງຄາມຫວຽດນາມ ຫຼື ຈາກຂໍ້ຂັດແຍ່ງອື່ນໆ.